Interstate 180 connects Interstate 80 with Downtown Lincoln, the state capitol and the campus of the University of Nebraska-Lincoln. The freeway spur doubles as U.S. 34, which ties into the north end from Woodlawn. Exit numbers along the route count upwards along southbound from Interstate 80. The destination for thousands of Nebraskans each year is to watch their beloved Cornhuskers play against the teams of the Big Ten, one of the oldest college football conferences in the country. 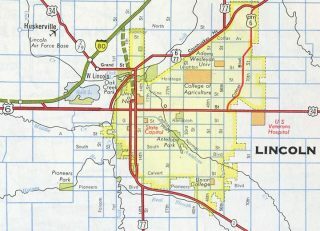 Memorial Stadium is located to the east of Interstate 180 off of 10th Street outside Downtown Lincoln. Photo taken 09/05/05. Interstate 180 under construction in 1962. The six ramp parclo interchange between Interstate 180 and Cornhusker Highway (Exit 1) was reconfigured to include two southbound off-ramps and a distributor roadway along northbound. Cornhusker Highway is the former route of U.S. 34 west from U.S. 6 at Belmont. Northbound Interstate 180 reaches Exit 1, Superior Street in north Lincoln just south of Interstate 80 (Exits 401D/C). Photo taken 09/05/05. Button copy signs previously posted along I-180 north for I-80 and U.S. 34. Photo taken by Rich Piehl (05/01). Interstate 80 and U.S. 77 are co-signed between Exits 397 and 405. The overhead signs were not modified to include U.S. 77 shields; instead, U.S. 77 trailblazer shields were added on the side of the road for those intending to connect with U.S. 77. Use Interstate 80 east to U.S. 77 north and use Interstate 80 west to U.S. 77 south. Photo taken 09/05/05. The first off-ramp at Exit 401 connects northbound Interstate 180/westbound U.S. 34 with eastbound Interstate 80 and northbound U.S. 77. Interestingly, the exit numbers at the northern terminus interchange belong to Interstate 80, not Interstate 180. This is a cloverleaf interchange; the connection to westbound Interstate 80 and southbound U.S. 77 is the second exit ramp (Exit 401C). The overhead sign advises that northbound Interstate 180 ends and that westbound U.S. 34 continues. Photo taken 09/05/05. The left two lanes carry U.S. 34/Purple Heart Highway northwest to the airpark (northern edge of the Lincoln Municipal Airport); it reduces to a two-lane road after leaving the urban limits of Lincoln. From here, U.S. 34 turns west to parallel Interstate 80 through Seward, York, and Aurora to Grand Island. U.S. 34 again intersects with Interstate 80 south of Grand Island at Exit 312. Photo taken 09/05/05. This one-mile advance junction sign for Interstate 80 and Interstate 180 is posted on U.S. 34 east prior to the Fletcher Avenue intersection. The final traffic signal along eastbound U.S. 34 is at Fletcher Avenue. About a half-mile south of Fletcher Avenue along U.S. 34 southeast is the interchange with Interstate 80. Photo taken by Jeff Morrison (07/29/07). A set of trailblazers for U.S. 77 north and south (concurrent with Interstate 80 east and west) is posted prior to the off-ramp to Interstate 80 west. Photo taken by Jeff Morrison (07/29/07). The first ramp in the Interstate 80 interchange is Exit 401C, Interstate 80 west and U.S. 77 south. The Interstate 180 freeway alignment begins here, and Interstate 180 carries U.S. 34 from here into downtown Lincoln. Photo taken 09/05/05. Continuing southeast, the next exit is Exit 401D, Interstate 80 east/U.S. 77 north. Southbound Interstate 180 and eastbound U.S. 34 continue to the next interchange, which is Exit 1, Superior Street. Photo taken by Jeff Morrison (07/29/07). A bit further west (and after the U.S. 77 junction), this mileage sign provides the distance to Exit 401, Interstate 180/U.S. 34; Exit 399, Municipal Airport; and Exit 397, U.S. 77 south. Photo taken 09/05/05. Interstate 180 is a short spur that connects transcontinental Interstate 80 with downtown Lincoln, the state capital of Nebraska. The freeway crosses the railroad tracks that separate downtown from northern Lincoln. Exit 401 also connects to U.S. 34, the original route west to Seward, York, Aurora, and Grand Island before the Interstate was built. Photo taken 09/05/05. Westbound Interstate 80 and southbound U.S. 77 reach Exit 401, Interstate 180 and U.S. 34. This exit connects to a collector distributor ramp that provides access to both westbound U.S. 34 and southbound Interstate 180/eastbound U.S. 34. Photo taken by Steve Hanudel (05/15/06). Now on the collector distributor lanes, the first ramp (Exit 401A) connects to westbound U.S. 34 to Seward. The second ramp provides the loop ramp to southbound Interstate 180 and eastbound U.S. 34. Photo taken 09/05/05. After passing under the Interstate 180/U.S. 34 overpass, the collector distributor lanes split again at Exit 401B. The loop ramp departs onto Interstate 180 south, while the collector distributor lane continues straight ahead to merge back onto westbound Interstate 80. Photo taken 09/05/05. Note the close-up of the Interstate 80 pull-through sign; the shield contains the state name, which was common in 1990 but was a rarity in the Cornhusker State in 2005. Photo taken 09/05/05. Eastbound Interstate 80 approaching Interstate 180 near Lincoln. Photo taken by Rich Piehl (05/01). Eastbound Interstate 80 at Interstate 180 near Lincoln. Photo taken by Rich Piehl (05/01). 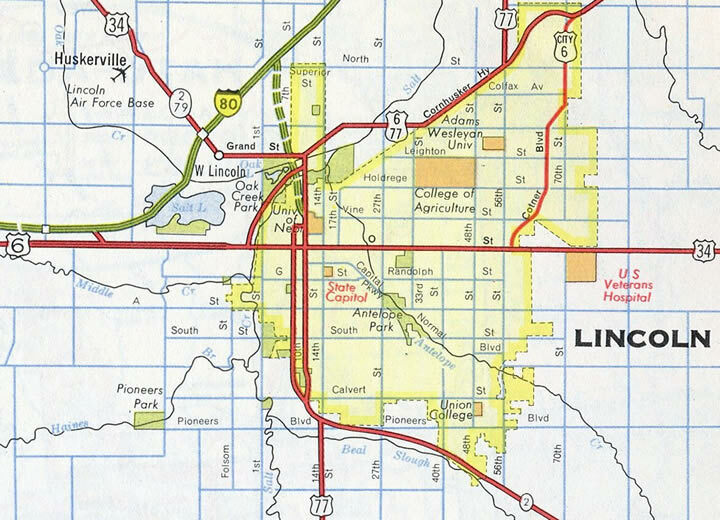 Southbound Interstate 180 and eastbound U.S. 34 reach Exit 2, Cornhusker Highway east to U.S. 6 and west to the Lincoln Municipal Airport. This is the last interchange along southbound Interstate 180 before crossing the railroad viaduct and entering downtown Lincoln. Photo taken 09/05/05. This photo shows the signage on the collector distributor lane from southbound Interstate 180 to the Cornhusker Highway (Exit 2). The first ramp connects to westbound Cornhusker Highway en route to the Lincoln Municipal Airport, while the second ramp connects to Cornhusker Highway east to U.S. 6/Sun Valley Boulevard. Photo taken 09/05/05. Prior to the railroad viaduct, downtown Lincoln comes into view. The city is dominated by the State Capitol, which is the tall tower amid the many mid-height buildings. 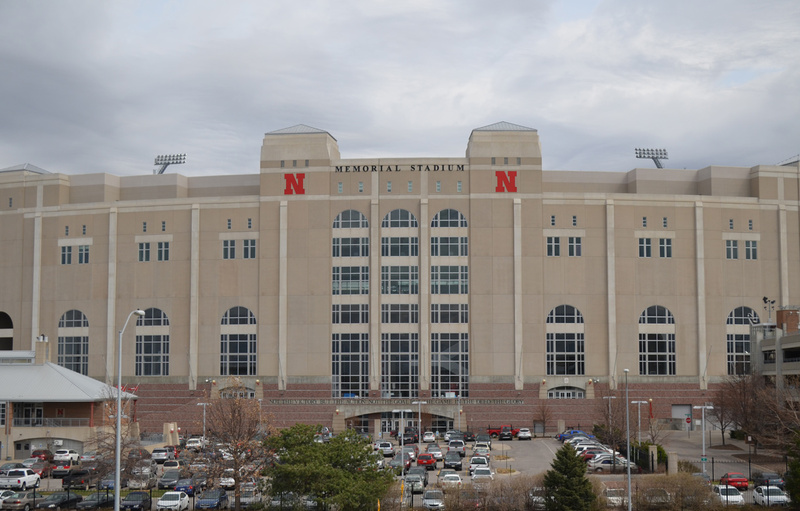 On the east side of Interstate 180 is Memorial Stadium, home to the pride of Nebraska: the University of Nebraska Cornhuskers football team. Note the red billboard on the right side of the freeway. Photo taken 09/05/05. After crossing the railroad viaduct, southbound Interstate 180 and eastbound U.S. 34 descend to ground level and prepare to merge onto 9th Street. Interstate 180 ends at the point where traffic from 9th Street merges onto the freeway. Photo taken 09/05/05. Interstate 180 ends as the freeway merges onto southbound 9th Street in downtown Lincoln between S Street and R Street. There is no end shield present. U.S. 34 east will follow southbound 9th Street; U.S. 34 west uses adjacent 10th Street, which is one block to the east. U.S. 34 will again turn east at O Street, which is only three or four blocks south of here. Photo taken 09/05/05. Now on U.S. 34 east/9th Street southbound, the first intersection after the end of the Interstate 180 freeway is this intersection with R Street. For the continuation of U.S. 34 east, continue south for three blocks to O Street, then turn left. Photo taken 09/05/05. This is the intersection of southbound 9th Street and P Street in downtown Lincoln. Signage for the continuation of U.S. 34 east is posted on both sides of southbound 9th Street as it approaches the intersection with O Street (one block ahead). Photo taken 09/05/05. Now at the intersection of southbound 9th Street at O Street, this pair of shields point the way to U.S. 34 east (left turn) and to Interstate 80 west (right turn). O Street is former U.S. 6 and connects directly to it and Cornhusker Highway less than a mile west of here. Photo taken 09/05/05. Now traveling east on U.S. 34 (O Street) through downtown Lincoln, this overhead sign is posted at the intersection with 10th Street. Follow 10th Street north for about five blocks to merge onto northbound Interstate 180 and westbound U.S. 34 to the airport and Seward. Photo taken 09/05/05. Continuing east on O Street, an Interstate 80 shield and U.S. 34 shield is posted on the traffic signal for 10th Street. Turn left to follow Interstate 180 north/U.S. 34 west to Interstate 80; continue straight ahead to follow U.S. 34 east to Walton, Eagle, Union, and Plattsmouth. Photo taken 09/05/05. Now traveling west on U.S. 34 (O Street) through downtown Lincoln, this overhead sign is posted at the intersection with 10th Street. Follow 10th Street north for about five blocks to merge onto northbound Interstate 180 and westbound U.S. 34 to the airport and Seward. Note the signage for Interstate 80: either westbound O Street or northbound 10th Street connects to Interstate 80 from here. It is generally faster for westbound Interstate 80 travelers to follow O Street west to U.S. 6/Nebraska 2; it is faster for eastbound Interstate 80 travelers to use Interstate 180 north. Photo taken 09/05/05. Eastbound U.S. 34 (O Street) reaches 10th Street. Turn right to follow 10th Street north for the continuation of U.S. 34 east to Interstate 180. Continue straight ahead to U.S. 6 and Nebraska 2 west to Interstate 80. Photo taken 09/05/05. Traveling north on U.S. 34 west/10th Street, these signs advise of the pending junction with Interstate 180. Use the left two lanes for the connection onto Interstate 180/U.S. 34 northwest to Interstate 80. Photo taken 09/05/05. Eastbound U.S. 34 (10th Street) reaches the last traffic signal prior to the Interstate 180 split at Q Street. Photo taken 09/05/05. Interstate 180 north begins here, as the two left lanes of 10th Street depart onto the nascent freeway. U.S. 34 west follows Interstate 180 north toward Interstate 80. Meanwhile, the right three lanes carry 10th Street north, with connections to Memorial Stadium. Photo taken 09/05/05. After the split from 10th Street, the first reassurance sign for northbound Interstate 180 and westbound U.S. 34 is not a shield, it is a guide sign. The freeway will cross over the railroad viaduct as it travels the approximately three miles to the rendezvous with Interstate 80. Photo taken 09/05/05. 50 Years of Interstate – Nebraska and the Nation. Page updated March 17, 2016.